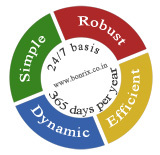 Bonrix S oftware Systems is the leading Group SMS Software provider in INDIA. It commenced from the year 2001. 1. Providing unparalleled customer support. 2. Developing long relationships with our clients. 3. Using the best development technologies available. 4. Using the latest software development methodologies. 5. Being abreast of every new technology arena. We are stubborn ? as far as the quality is concerned that’s the way we are. We believe in receiving best, and we know that prior to receiving, giving best is required. And we follow what we believe. The solutions we offer are based on personal requirements of every client. We first study the requirements of our client, suggest a solution and finally make appropriate changes according to their feedback. The bottom line is that the client need should be met. Our technical expertise and innovative concepts allow us to adapt to the client’s need. 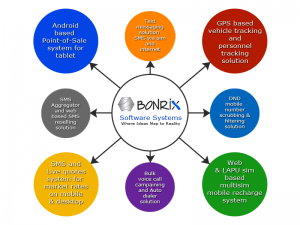 Bonrix Software Systems are expertise in the field of IT Solutions the most revolutionary field. The latest technology is used to execute the work in the area of Information Technology field. Bonrix’s expert staff deal with most modern, major software platforms, with a specific focus on ASP, Microsoft .NET and J2ME. We have many complex projects on Microsoft platform, utilizing the most appropriate toolsets and development systems for the specific task.